This netting is 48 in. tall with stronger posts is a very secure choice for very critical situations, e.g. gateways, keeping bulls in (and out) and protecting the farm garden. 10 horizontal strands (9 energized). String verticals every 6 in. 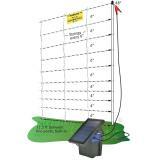 Line posts (built-in) every 12.5 ft.
Post diameter is 0.75" dia. Post spikes (SS): .31" dia., 8" long. Post spikes (DS): .31" dia., 7" long. Electric netting was invented 45 years ago as temporary sheep fencing. But owners of sheep who also had cattle found electric netting to be a very effective and easy-to-use temporary cattle fence. (As a bonus, it stops pigs, dogs and coyotes.) Even though reel-based temporary cattle fences are less expensive, unique netting features offer important advantages. Gateways. Netting is much more visible and reliable than single-strand options. Cows with calves. Curious calves don't challenge netting. Protecting windbreaks and feed supplies. Netting's extra reliability provides an extra assurance factor. We know barbed-wire fence works for this, but installing and removing "barb" takes much more time and effort than doing the same with netting. We suggest installing PermaNet with two people. Why? Because of its extra weight and longer posts. It can be handled, installed and removed by one person, but having another person on each end of the posts doubles the productivity and makes it easier for both. Weeds must be controlled for PermaNet to remain effective. Either move and mow as needed during the growing season, or spray herbicide along the bottom strand to kill the vegetation. If you can’t do this, PermaNet may not be the right fence for you.